Biometric is the way of capturing a person’s physical or behavioral characteristics or traits which can be used for authentication or identification. One of the biometrics that used on this system is the face biometric for verification or authentication. The reasons of using face biometric are that it requires less cost than the others and more hygiene that users don’t have to do physical contact with the device. 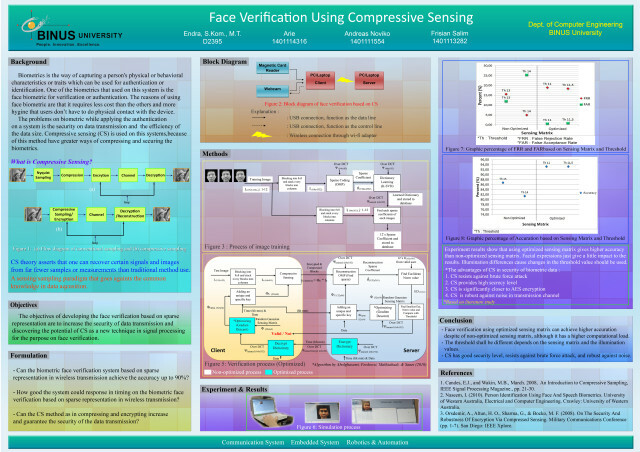 This face verification system uses sparse representation algorithm which is a part of compressive sensing (CS). In this method, face image is represented in sparse signal. The sparse signal is used to find Euclidean norm value of tested sparse signal and training sparse signal. The smallest Euclidean norm value will be compared with the threshold value that have set on the system. If the smallest Euclidean norm value is smaller than the threshold value, the tested face image is valid and vice versa. This system can reach accuracy about 80% – 88% by using non optimized sensing matrix with average of time about 4.37 seconds. If using optimized sensing matrix, this system can reach accuracy about 92% – 94% with average of time about 8.73 seconds. The other advantages of CS in this system is the process of compression and encryption can be done just in one step, which reduces the size of the data and ensure the security of the data. In the other words, face verification system with using CS is suitable to apply if want to get high accuracy with reduction and encryption in the data.